Phil and Amy Parham, contestants on NBC's The Biggest Loser, provide a faith-based, informative, and motivational book that will encourage those facing weight challenges to permanently transform their lives and live their dreams of being healthier, happier, and more fit. The Parhams know from personal experience the obstacles to fitness that overweight readers face. Having lost a combined total of 256 pounds, they come alongside readers to provide inspiration, motivation, and practical life skills on their 90-day journey toward better health and lasting weight loss. 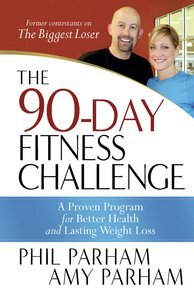 About "The 90-Day Fitness Challenge"
Amy Parham co-authored with her husband, Phil, The 90-Day Fitness Challenge and The 90-Day Fitness Challenge DVD. She and Phil were contestants on Season 6 of NBC's The Biggest Loser. Over a seven-month period, they recorded the highest percentage of weight loss of any couple in the program's history. Married for more than 20 years, they live in South Carolina with their three boys, Austin, Pearson, and Rhett. Phil and Amy Parham, authors of The 90-Day Fitness Challenge and The 90-Day Fitness Challenge DVD, were contestants on Season 6 of NBC's The Biggest Loser. Over a seven-month period, they recorded the highest percentage of weight loss of any couple in the program's history. Married for more than 20 years, Phil and Amy live in South Carolina with their three boys, Austin, Pearson, and Rhett.